The Met Office has issued a Yellow Weather Warning for ice across much of Northern Ireland and Scotland. The warning is in place from 6pm tonight to 10am on Friday. The Met Office said to expect some icy patches to form on untreated roads, pavements and cycle paths on Thursday evening and overnight into Friday. 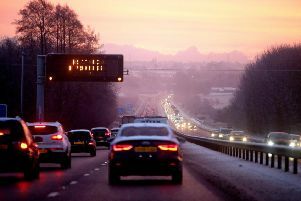 The Roads Service in Northern Ireland also said road surface temperatures are forecast to fall sub-zero, giving a risk of icy conditions.